1.BM-42(54)/PUR/2018/ (380): E-tenders for Supply and installation of 10 Nos Desktop Computer at District Science Centre, North Lake Road, Purulia. 2. 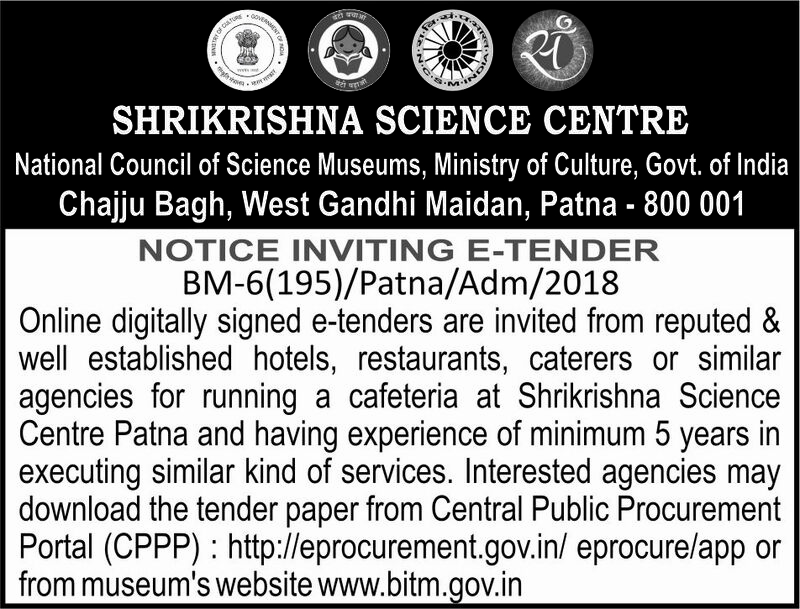 BM-6(195)/Patna/Adm/2018 : Inviting E-tender for running a cafeteria at Shrikrishna Science Center.Link for searching E-Tender is given at the bottom. The date of bid submission and document download/sale in connection with operation of cafeteria at Shrikrishna Science Centre, Patna has been extended to 24.05.2018 upto 11:30 a.m.
3. Inviting E-tender forAir Conditioner:Link for searching E-Tender is given at the bottom. 4. E-tender no BM-47(31)/PUR/2018 (44) : For fabrication of wooden cabinets at BITM, Kolkata. Link for searching E-Tender is given at the bottom. 5. E-tender no BM-47(31)/PUR/2018 (45) : For installation of auditorium chairs at SSC, Patna. Link for searching E-Tender is given at the bottom. 6. BM-47(31)/PUR/2018 (57): E Tender Invitation for purchase of computers.Link for searching E-Tender is given at the bottom. 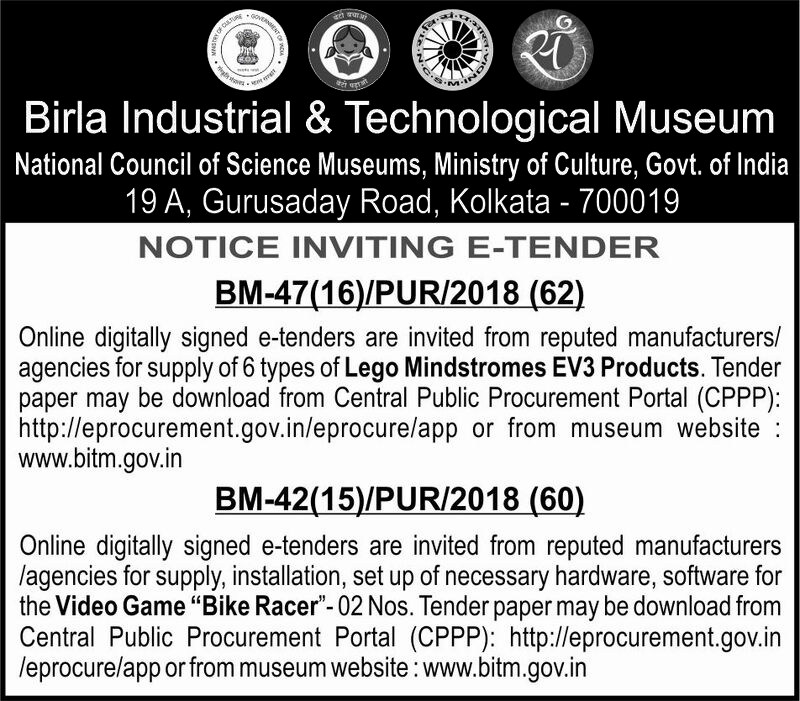 7.BM-47(16)/PUR/2018 (62) : Inviting e-tenders for six types of Lego Mindstromes EV3 Products. Link for searching E-Tender is given at the bottom. 8.BM-42(15)/PUR/2018 (60) : Inviting e-tenders for the video game “Bike Racer” 02 Nos. Link for searching E-Tender is given at the bottom. 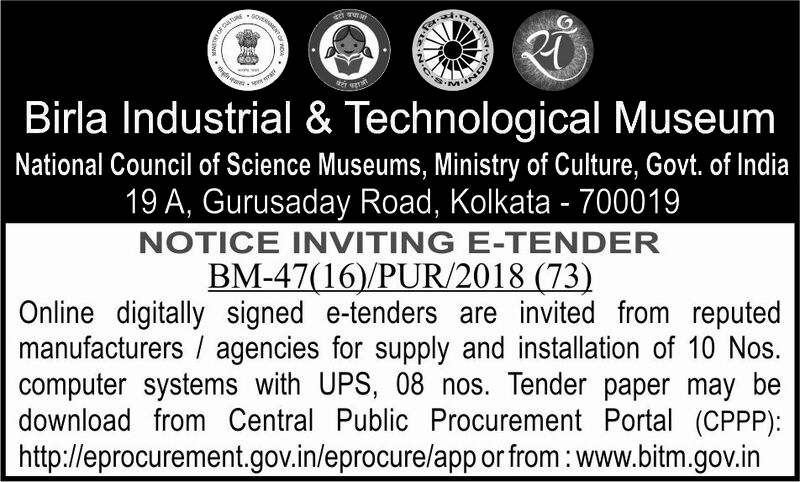 9.BM-47(16)/PUR/2018 (73): Inviting e-tenders for 10 Computer System with UPS. Link for searching E-Tender is given at the bottom. 10.BM-47(6)/PUR/2018 (19): Inviting e-tenders for Commercial Flooring (Quantity – 2700 Sqft). Link for searching E-Tender is given at the bottom. 8) Dhenkanal Science Centre, Dhenkanal has been extended to 26.07.2018 upto 12:00 noon. 15. BM-42(54)/PUR/2018 (137) :- Tender advertisement for Renovation work of the Walk through Diorama inside Wealth of Purulia Gallery at District Science Centre, Purulia. 16. BM-47(16)/PUR/2018(144): – Tender advertisement for supply and installation (a) Monocular microscope with imaging system (b) Trinocular microscope with imaging system (c) Trinocular stereo zoom microscope with imaging system and (d) Measurement software (Labomed digital software) at Digha Science Centre. 17. 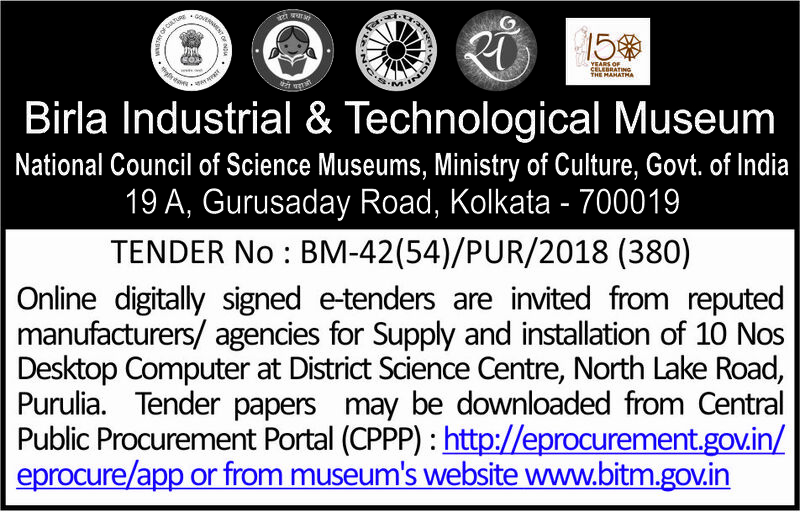 BM-42(15)/PUR/2018 (149) : – Tender advertisement for Supply of Adobe Creative Cloud All apps licence and Corel Draw Graphics Suite 2018 licence at Birla Industrial and Technological Museum, Kolkata. 19.Tender No.BM-47(31)/PUR/2018(166), BM-47(16)/PUR/2018(167) :- Installation of Air Conditioners. 20. Tender regarding extension of dates regarding procurement of Air Conditioning Machines for Digha Science Centre.